What kind of scuba equipment do divers use? How Deep and How Long are divers down for? How Cold is it in the water? What gas do divers breathe? 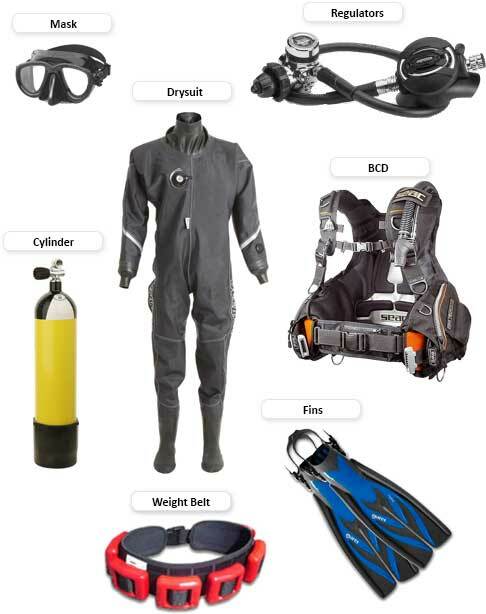 The above is the basic scuba kit that all divers will normally carry. In addition to this, and depending on what kind of diving is taking place, divers can carry a range of extra equipment to supplement the basic kit. This can include knives, dive computers, torches, and underwater cameras to name a few. How Deep / How Long are divers down for? 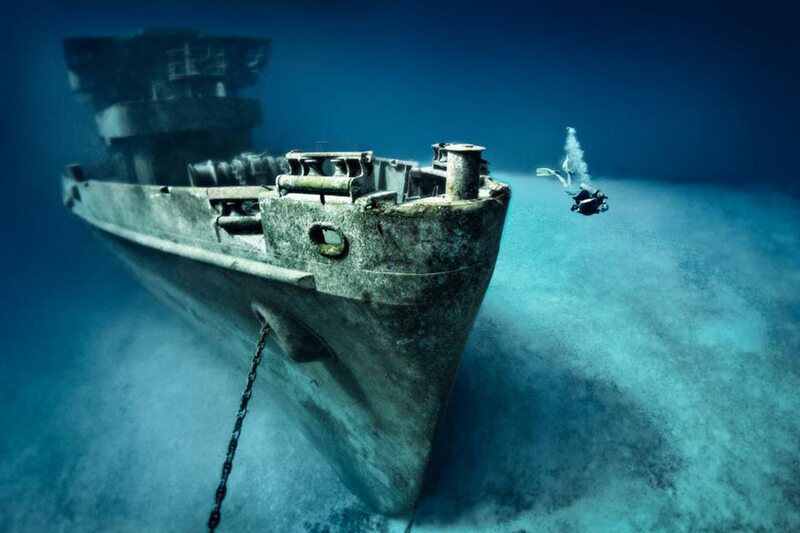 One of the most common questions asked of divers is “how deep do you go?” or “how long do you stay down for?”. As a broad generalisation, most recreational diving takes place around a depth of about 10-40 meters and for around 30-50 minutes. However, a standard cylinder of air can last over two hours at shallow depths and the current depth record for Scuba Diving stands at 318m! The length of time a Scuba Diver spends underwater depends largely on the depth he plans to dive to. For example, at 10 meters, a diver will use twice the amount of air as he would on the surface and at 40 meters he would use 5 times as much! The water temperature varies significantly around the world. 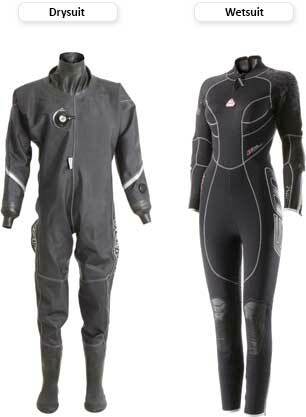 To get round this, divers wear different types of exposure suits. In the UK, water temperatures are generally around 8-12°C, and divers normally wear drysuits for warmth. These are sealed at the neck and wrists, keeping the diver completely dry. In comparison, water temperatures in more tropical locations such as the Red Sea and the Maldives reach around 29-30°C. Here divers only need short-sleeved wetsuits for protection. It is a common misconception that scuba divers breathe oxygen underwater. In fact, breathing oxygen below a depth of 6 meters is toxic, and can be fatal! The majority of scuba divers actually breathe normal air when diving within normal recreational limits (shallower than 40m), however Nitrox (a mix of nitrogen and oxygen) has become more popular in recent years. As divers go deeper (beyond the normal 40 metre limit) they enter the world of technical diving which involves carrying more cylinders with different blends of Nitrox (a mix of Nitrogen and Oxygen) and Trimix (a mix of Nitrogen, Oxygen and Helium). These are needed as the human body absorbs different percentages of breathing gasses at different pressures (i.e. at increasing depth). Decompression Illness & "The Bends"
When talking about diving, most people have heard of &apos;the Bends&apos;. The Bends, or decompression sickness (DCS) to give it it&apos;s proper name, results from inadequate decompression after being at depth for a period of time. It can be caused by divers doing a &apos;rapid ascent&apos; or not completing necessary decompression stops (safety stops) at the end of a dive. When this happens, nitrogen which has been absorbed by the body as a result of being at pressure, quickly comes out of solution and forms small bubbles in the tissues or bloodstream. Where this happens near the joints or spinal chord, it can lead to long term pain or even numbness and paralysis. Most forms of DCS require urgent medical assistance and normally result in transfer to a re-compression chamber. This is a brief guide to the sport of scuba diving – in no way can it replace a proper training course. Diving is an extreme sport and can be dangerous for those who have not received proper instruction. If you are interested in learning to dive, check out our training page or get in touch with us.